Camellia Beauregard is a Belle. In the opulent world of Orléans, Belles are revered, for they control Beauty, and Beauty is a commodity coveted above all else. In Orléans, the people are born grey, they are born damned, and only with the help of a Belle and her talents can they transform and be made beautiful. But it’s not enough for Camellia to be just a Belle. She wants to be the favourite, the Belle chosen by the Queen of Orléans to live in the royal palace, to tend to the royal family and their court, to be recognised as the most talented Belle in the land. But once Camellia and her Belle sisters arrive at court, it becomes clear that being the favourite is not everything she always dreamed it would be. Behind the gilded palace walls live dark secrets, and Camellia soon learns that the very essence of her existence is a lie, that her powers are far greater, and could be more dangerous, than she ever imagined. And when the queen asks Camellia to risk her own life and help the ailing princess by using Belle powers in unintended ways, Camellia now faces an impossible decision. With the future of Orléans and its people at stake, Camellia must decide, save herself and her sisters and the way of the Belles, or resuscitate the princess, risk her own life, and change the ways of her world forever. Sixteen year old Camellia Beauregard is a Belle, a young woman disciplined in the artistry of beautification. On debut, Camellia and the Belles of Maison Rouge De La Beauté will perform for the cosmopolites of Orléans in the Beauté Carnaval, the Favourite chosen as the Royal Belle while her fellow sisters, blessed by the Goddess of Beauty, will be appointed to Tea Houses around the Kingdom. In Orléans, citizens are are depleted of colour, their monochrome appearance dependant on each generation of Belles to beautify the wealthy and privileged citizens by bringing forth the Acana. Camellia is a grandiose young woman, her beauty and Belle stature are celebrated throughout the kingdom. From a tender age, Camellia has been cautioned to the significance of her responsibility, become the favourite. Competing for the converted position are her five fellow Belles, Edelweiss, Padma, Valeria, Hana and Camellia's childhood companion Ambrosia. While Camellia with her mischievous temperament enjoyed the spoils of her gilded cage at Maison Rouge De La Beauté, Ambrosia demanded perfection. Ambrosia is a character of contrasts, a tender girl with a gentle disposition but beneath the surface is insidiously competitive. I admired the carefree, nonchalant boldness of Edelweiss, unafraid and unconcerned about the Belle position. As the narrative progresses, Edelweiss' insolence towards authority takes on a greater importance. Fiercely loyal and rebellious, I cherished her character. The Belles must adhere to stringent guidelines. Only those with wealth and privilege are worthy of embellishment and in no circumstances should a Belle associate with men beyond a professional compacity or engage in consensual relationships. Charismatic Auguste Fabry is the son of the Minister of the Seas and although aware of the forbidden nature to engage with Auguste, Camellia is captivated by his confidence and insistence. The kingdom of Orléans is flushed with colour and glamour, the splendour the royal family of Orléans is eclipsed by the despair for their eldest daughter. Heir to the throne Princess Charlotte, who remains unconscious while the abhorrent Princess Sophia presides over extravagant parties. Sophia is a vindictive young woman, consumed by jealousy and hostility. Beneath the imaginative extravagance is a narrative that explores cultural and racial identity, confidence, esteem and perception, challenging the confines of affluence and privilege. 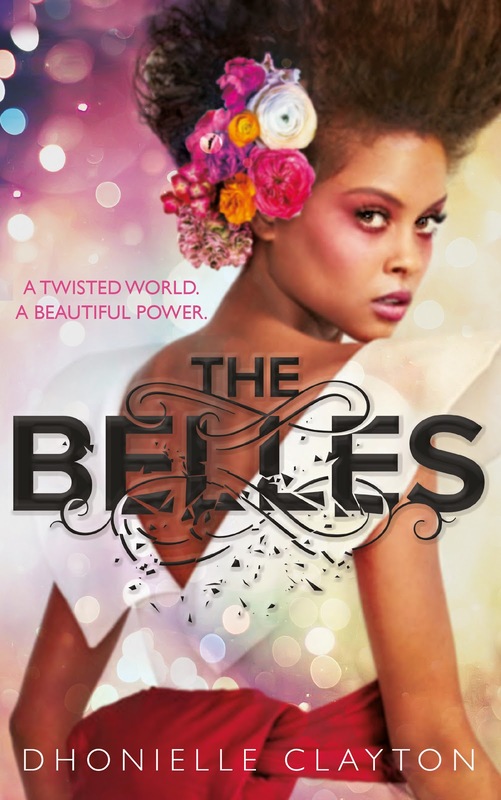 The Belles is exquisitely lyrical and atmospherically enchanting. Impeccable reading. THIS SOUNDS SO GOOD, KELLY! I'll admit, I've been really hesitant about whether or not I should read this one since the hype was eating at me, but I'm definitely all for diversity and girl power! <3 So glad you enjoyed this one, lovely. I'm usually hesitant to read big releases for pretty much the same reason but ohhh it was magnificent! The writing especially is absolutely immaculate. It's breathtaking. It's actually quite sinister in comparison to The Selection. Similar where the Belles compete to become the Favourite but that's where the similarities end. It's brilliant Anna, the wait for the sequel is going to be agonising. This sound amazing. Normally, I want battles and action but strangely, this sounds absolutely appealing to me. I actually can't believe how badly i want to read this. When looks mean everything, this feels so relevant. Great review! Isn't it Rebecca and something we can all relate to. How critical others and ourselves ate of our own appearance. I'll be buying a copy as soon as it's released for my shelves to read again. So keen to read this! I am itching to get my hands on a copy! It sounds all kinds of wonderful. Loved your review, and now my impatient little heart just has to wait until I've got enough pocket money to do another booktopia splurge. It's truly amazing. The writing is so lyrically beautiful as well as being atmospheric. An instant favourite. Definitely preorder, you won't be disappointed. I keep seeing this one around the place and have been rather intrigued by the premise. Glad to see that you enjoyed it Kelly, I was a bit concerned it's one of those overhyped ones heh. That's always the risk isn't it, it never quite lives up to our expectations but this was not only brilliant but far surpassed mine. The narrative is atmospheric and intricate with incredibly sinister tones. It'll be one of the must read books of the year! Ah! I'm so excited for this one. I love that cover, but it's good to know that the inside is just as good. I love the sound of the characters too! I can't wait to meet them and be immersed in this world. Great review, Kelly! I'm going to bug Nereyda to send me her copy ASAP! This book is everything! Yes! You need to read it as soon as possible, it's absolutely brilliant! This sounds really intriguing. I had it on my radar because how often do you see a POC on the cover of a book? I wasn't totally sure what it was about but it sounds so good and such a good read. I will totally have to read this, it's high up on my TBR list. It's phenomenal Becky, so lovely and lyrical and the writing is breathtaking! I haven't read that yet but after The Belles, added it to my list. This one is incredible! I love how this book brings us back to the age of dystopians but it kind of makes it more relevant with the cultural identity and everything. I'm so glad you loved it Kelly, I'm really looking forward to reading this one! It's been so, so long since there was a great dystopian fantasy fusion and this is absolutely incredible, so lyrical. this give a whole meaning to the Belle of the Ball! Just wondering, is it a power or some study is involved? Both actually Ailyn. The Belles are the only ones born with colour, in a Kingdom where everyone is black, white and shades of grey. They've spent their lives training for when they turn sixteen and are then put to work to beautify those with enough money. It's incredible that you got to read this book already, Kelly! It is my most anticipated book of the year, no kidding, haha. I had a good feeling about it overall, but your review makes me even more impatient to read it, these characters sound SO interesting. It was available on Netgalley and I clicked so damn fast, it was one of my most anticipated reads as well. The only trouble is that now I have to wait even longer until book two is released. The wait may kill me. I need to read it! I've seen it around and it hasn't piqued my interest but after reading this, I'm dying to read it. She's brilliant, you'll love The Belles! Sounds like this author really knows how to take real life and blend it well into a wonderfully crafted novel, this sounds really great! I have seen people haul this on youtube and the excitement for the book and the blurb has been infectious. It's magnificent Lily, definitely worth all the buzz. I'd love to see what you think of it! You've made me super excited to pick this one up---which I'll be doing very soon!! Sounds like it explores a lot of topics in a really thoughtful way. I'm do excited that you'll be reading this soon Nicole. I knew I'd enjoy it but I completely fell in love. I haven't felt like this way about an author since I'd first discovered Tahereh Mafi and Jandy Nelson. It was phenomenal Amy, I'd love to see what you think of it. I'm so very excited for this book! I love the gorgeous colourfulness of the cover, and the premise. And that it is diverse, of course. The way you described the world has me very intrigued to pick up my copy when it arrives! It feels like it's been an age since I picked up an extravagant fantasy, and I think this one will be a contender for the best. It's amazing Chiara, beneath the oppulance there is themes of racial identity, sexism, the objectification of women and all challenged within the narrative. So lyrically lovely. Whew, this sounds gorgeous, and compelling and filled with complicated women, which I am loving! It's absolutely brilliant, no doubt it'll be one of the books of the year. Thank you so much Charlotte! It's truly incredible and the writing! My goodness, it's absolutely immaculate. I can't wait for you to pick up a copy to see what you think of it.